IOFM’s certification programs set the gold standard for financial operations professionals who want to ensure that their teams are best-in-class. Our programs offer rigorous training and individuals who complete the program must demonstrate a firm grasp on the fundamentals, a thorough understanding of best practices and a commitment to accuracy and compliance. Over 25,000 financial operations professionals have achieved IOFM certification. They represent leading Fortune 500 companies, colleges and universities, non-profits and organizations from around the globe. IOFM developed certification programs to fit flexibly and seamlessly into your teams’ schedules so staff can engage in valuable training without accruing T&E expenses or losing productivity. Certification from IOFM is available entirely online – no travel or out-of-office time required. Candidates have up to a year to complete the program at their own pace, for maximum flexibility and minimal disruption. An online study guide, training video and practice exam are designed to prepare every candidate for success. Everyone is allowed up to three attempts to pass the exam, so even candidates who struggle with test-taking have the opportunity to review and succeed. Knowing that a staff member passed the certification exam offers you critical insight into individual and departmental performance. Certifying your finance and accounting teams provides upper management with clear, measurable performance improvement metrics that demonstrate your team’s accountability and commitment to being best-in-class. To maintain certification, candidates must earn 15 Continuing Education Units (CEUs) annually. IOFM offers many free or low-cost opportunities to earn CEUs, and many professional training opportunities, are eligible for credit. Candidates can submit and monitor their CEUs in an online account, making it easy and efficient to stay up to date. To learn more about IOFM Team Certifications, including volume pricing discounts, contact training specialist Allison Hughes - by email, or at: 207-842-5663. 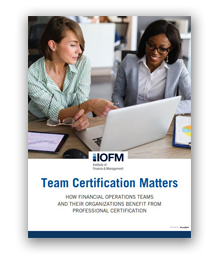 Read comments from your peers on the immediate ROI that financial operations departments see by enrolling in IOFM’s industry-leading Certification programs in our new whitepaper.